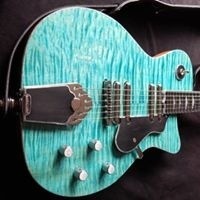 Neck angle: when I insert my specs into https://www.tundraman.com/Guitars/NeckAngle/index.php it gives me an angle of 1.9... But for some reason I thought flat tops and low bridges (see below) did not need a neck angle? Pick up cavities: 70 x 38mm for both bridge & neck, not sure what depth... Any opinions? I would appreciate any insight you guys have, especially with regards to the things in bold. I appreciate this is a lot to ask, and so if you've made it this far down - thanks for reading! The headstock angle only needs to be enough to keep the string firmly in the nut when under high attack. Anything from 7 degrees and up has been used. If your angle is too low, just add a string tree like Fender does. The neck angle is purely an element of design. It is based upon the height of the bridge saddles at the lowest setting and the height of the fretboard over the body at the neck join. If your fretboard is the same height (or just a hair lower) as the bridge saddles, no angle is required. If it is lower, neck angle is used to line the stings up with the saddles. The depth is determined by the thickness of the neck at the heel and how much clearance is require to line the strings up with the bridge saddles. Wait till you have your pickups in hand. 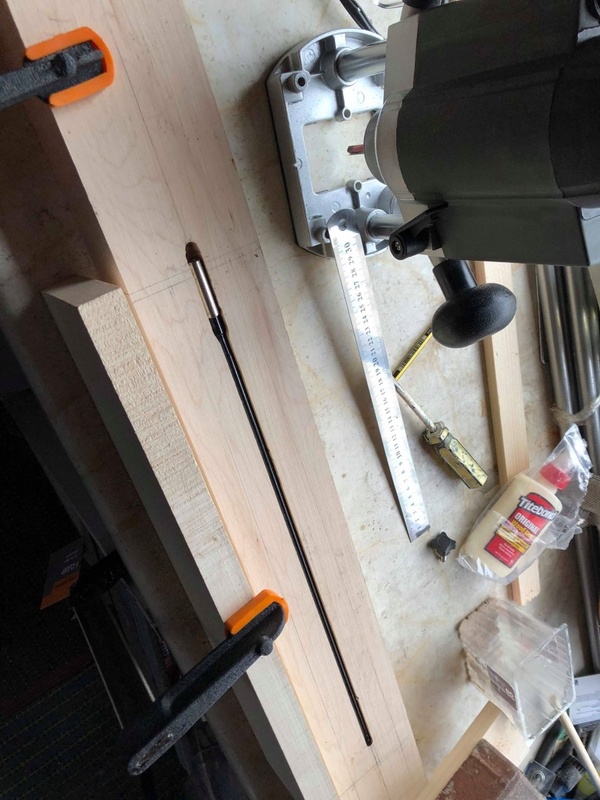 Measure them from top to bottom to determine how much depth is require to mount them in proper relationship to the fretboard and string height. Thanks SR for helping clear a lot of that up! I will do more research on neck angle... My bridge is 11mm at its highest point and you mentioned it depends on the fretboard height. If I have a fretboard that is flush with the body, I imagine that will be 5mm (due to the width of the fretboard) - so isn't that quite a large discrepancy? I already have my pick-ups, but I'm still curious as to what depth to use, aka how much of the pickup should stick up out of the guitar. Also, shouldn't that differ in the neck and bridge positions? 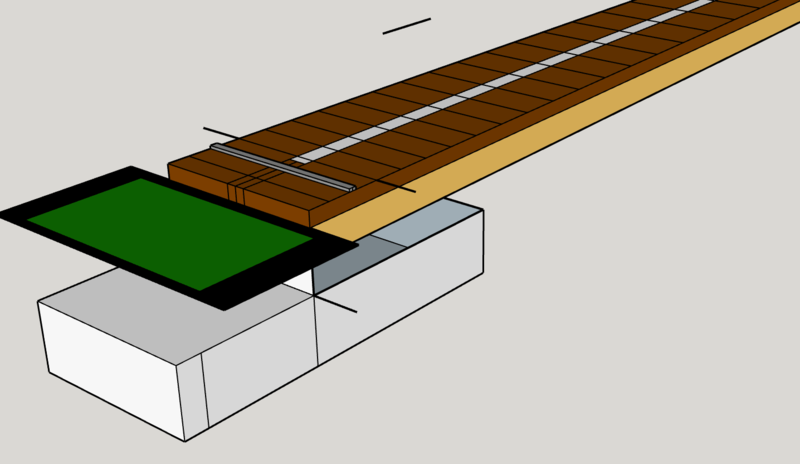 The depth of the neck pocket depends on the bridge used: when the saddles on the bridge are set to their lowest position the strings should touch the fingerboard. The pocket depth is therefore "thickness of neck plus fingerboard (25mm or 1") minus lowest possible saddle height". 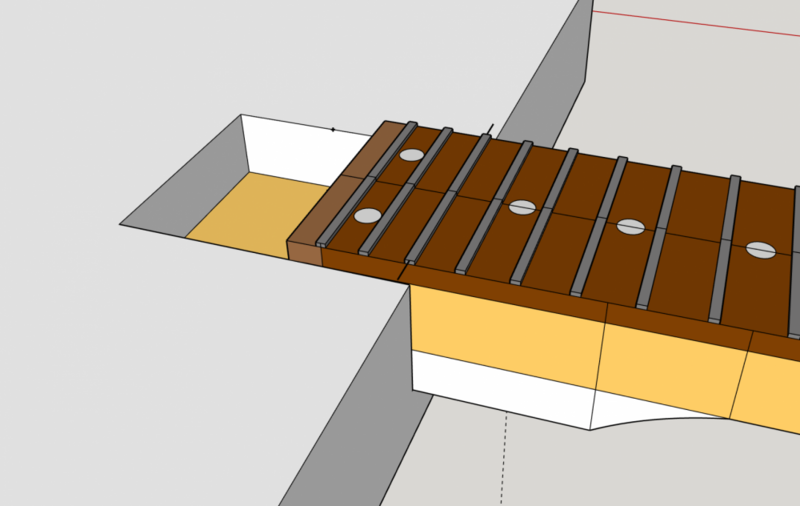 So I guess I'll need to measure the saddle of my gotoh hardtail bridge when it arrives (unless anyone has that handy haha). This method makes sense to me, but I want to be sure of it before progressing with the build - so can somebody also verify? I've made a few guitars with 10º headstock angle and it's fine, but the last few guitars have been 11º which I think is the perfect balance of string tension vs strength whilst not requiring insanely thick neck blanks. This is how I do neck angle. The actual angle doesn't matter a jot, just get a block of wood that is the hight of the bridge + 2mm - height of fretboard and frets, stick it at the position of the scale line and plane down the front. Then when you want to route your neck pocket, leave the block there and stick the template down. The floor of your neck pocket will sit at the correct angle and you wont have to angle your neck tenon. But I've found that my break angles usually end up at about 2º when I'm using PRS style wrapround bridges. If you're building a PRS style guitar, the tenon extends under the neck pickup (deepset tenon) and you need to cut am L shape into the tenon for the pickup to fit, so a strat style neck heel will not do, you need a deeper neck pocket and a thicker heel so you've still got plenty to glue/bolt - I only leave about 10mm under the tenon when the body is 47mm thick in the middle. The depth of the pickup route doesn't matter hugely either, it's only the posts of the pickups that require the most depth, you can do that will a drill if you want. I tend to let the weight of the wood dictate how deep I'm making pickup cavities. Leo Fender designed his guitars to be economically made from readily available materials. Necks come from 1" thick blanks. That's why there is no neck angle and no headstock angle, just a half inch drop and string trees. The 3mm gap comes from height of the bridge and the fact of zero neck angle. That is how high the strings need to be be playable with that bridge. The fretboard has to sit 3mm proud of the body to achieve that proper string height. It could also be achieved with the addition of some neck angle....but Fenders are flat. The fretboard is also very thin on most fenders so it sits a little higher - as above, fretboard wood is much more expensive than neck wood so they would be able to get more fretboards out of a billet by saving 2mm on each fretboard. If you look at Les pauls, the fretboard is at least 2mm thicker and sits flush on the body. But I would always make the heel oversized if you can, it's much easier to fettle it down to the right height with a plane than it is to stick another piece on because it's too short. Thanks everyone for the informative replies! Ah I see, thats super interesting... I guess I'll be going with an angle then, would much prefer it to sit flush if I can! 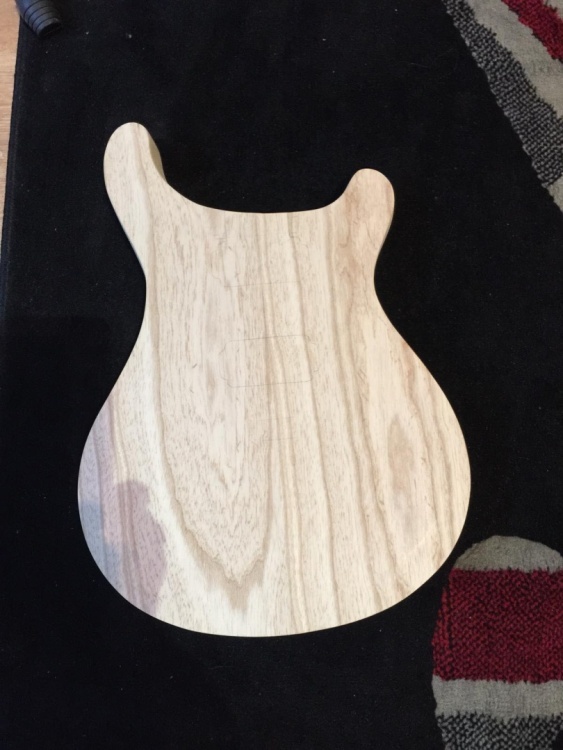 13mm - 6mm = 7mm block of wood at the bidge (scale line) position, then just plane down the front of the body with a jointer plane and the will angle the front of the guitar. The other thing you could do is us a potractor rule (I think that's what they're called, a protractor with a rule attached to it), offer that up to the block of wood and that will tell you how many degrees you need and you could then put that into the neck heel and keep the top totally flat, the downside of that is that your fretboard won't be parallel with the top of the body and might look weird. You need to make/buy a template for your neck and neck pocket, then stick the template to the top once you've done your angle into the top, Then when you route the pocket, the bottom of the pocket will be parallel with top and you break angle is done. Neck angle and tenon tick, headstock angle tick... Thanks a lot for helping me clear these up! Where does a heel usually start on a PRS? and how thick should it be? 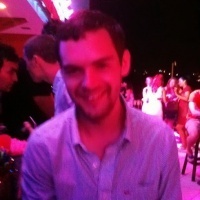 - I know it varies and thicker = more stable, but I just want to get a feel for the 'norm'. 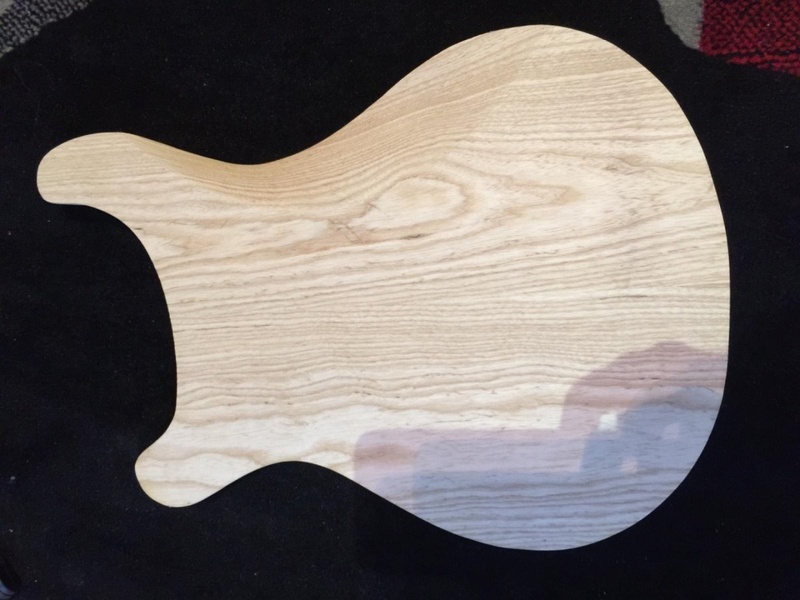 My current thinking is to start it around the 19th fret (as it joins at start of 23rd) and make it ~20mm (so full thickness, 20 neck, +5 fretboard, + another 20 for stacked heel). This also means my tenon will be 20. Pickup cavities... I'm still not 100% clear (I've overthought it). How much do pickups normally 'stick out' the body? I know the bridge is usually much higher, but is this due to cavity depth of just adjustment? Also, do the cavities need to follow the angle of the top for it not to look weird? I've got a 24 fret Mira and a 22 fret Paul's guitar, which I stare at regularly when trying to figure this stuff out. Both the Mira and the Paul's start curving up to the heel at fret 17 and the taper finishes at fret 19, which means the heel on the 22 models are longer in comparison to the neck. This is potentially just design thing but people do say that the bigger/longer the tenon, the better the sustain and tuning stability. This isn't the best pic in the world but it does show you how high the fretboard/pickup is from the body, there isn't a huge amount of room here. How much do pickups normally 'stick out' the body? I know the bridge is usually much higher, but is this due to cavity depth of just adjustment? The bridge is higher because of the neck angle and the bridge height combine to make the strings higher above the body in that area. For a no neck angle Fender you'll find the pickups at roughly the same height. How far the pickups stick out of the body is more a function of bringing them up closer to the strings. Somewhere between the base of the fretboard and the top edge is most common. You then adjust them higher or lower during or after the setup, whilst plugged in, to find the sweet spot--the height where they sound the best to your ear. Also, it is common these days for neck and bridge pickups to have different outputs. If one is noticeable louder than the other, they can be balanced a bit by lowering the loud one and raising the other one closer to the strings. I think I've run into a new problem whilst modelling the neck pocket (see image). Also, I wanted this to be a bolt-on but I'm not sure theres enough wood either. If your body is 44.5mm and your neck is 30mm (12+18) you can afford to add another 4mm to the tenon leaving 10.5mm under the tenon. I would recommend glueing the neck because a good glue joint is always going to be stronger than a bold on. Consider that drilling holes removed wood therefore removes strength but a glue joint is stronger than the wood itself so 2 pieces of wood become one stronger piece. I guess I'm just a little worried about messing it up and the neck being stuck in there... Plus PRS's are usually bolt-on anyways. But you're right, a set neck would be stronger. Do you have standard neck pocket dimensions you like to use? You have that wrong, most prs even the basses have set necks, it’s only they bolt on range or CE that arent. No I do make the neck first, then I make the body and neck pocket. That way the neck is ready to test fit as soon as I’ve routed the pocket. And I was wondering which way to insert the truss rod? Should the circular bit at the top be facing up towards the fretboard, or facing down away from it? I'm not sure whether it would matter at all, as its dual action. Also, how long do people usually make the access slot ? I've never done this but it is fairly common on strats to do this so that the nut sits higher and is accessible without cutting so deep into the headstock... the issue is going to be that now it will act in reverse afa tighten/loosen. if that's not a problem for you then sure. afa rattle... I cut my channel using a 1/4" bull nose bit and then chisel out the areas where it needs to be flat. this results in a fit that is so tight it doesn't seem to be as prone to rattle... that said I still throw some silicon in there to prevent it in extreme cases. hope that helps! Honestly I don't know, but whenever I've had a loose fitting truss rod before, I've put a strip of veneer down the side of it (not even glued) and that's solved the problem. It's always handy to have a roll on veneer hanging around!